My sharpie thumbnails of ui screens in super monday night combat. Don’t Be Afraid of a Pencil. What I want them to understand — for everyone to understand — is that sketching is one of the most critical skills I think you could learn if you work in any environment that requires you to build something, whether that’s a physical product or a piece of software. And you should learn to stop being afraid of a pencil and a piece of blank paper, because sketching is fast, visible, collaborative communication, and it doesn’t matter how well you can draw. When was the last time you drew something? Was it when you were twelve years old, and you drew a sweet Mustang car in your black and white compositional notebook during third period? Trick question; it doesn’t matter. Drawing is the act of trying to artistically render an image with a deep attention to detail. Sketching is the act of communicating an idea in visible form. 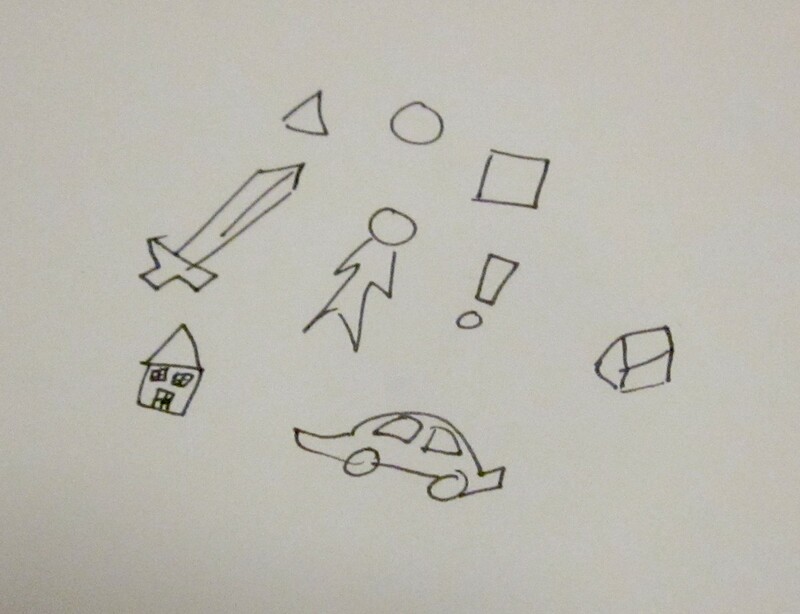 The only thing you have to know how to draw in order to sketch effectively for communication are basic shapes, like boxes, circles, and arrows. Can’t draw a sword or a house? That’s okay. You’ll probably still convey more information in your amateurish attempt than you would trying to explain something. Because when it comes to sketching, a picture really is worth a thousand words. Get five people into a room. Try getting everyone to understand a complex idea with words alone. Then try and weave their feedback and their own ideas into that idea using words alone. Then stand up at the whiteboard and draw it. More likely than not, you’ll hear a collective, “aha!” As everyone suddenly comes to the same simultaneous understanding with the power of a simple sketch. It’s difficult enough to hold and comprehend a complex and changing idea in your head alone. The difficulty is magnified when several people in a room have to do the same thing, with each person forming their own internal sketch of what you’re talking about. And that internal sketch is probably very different from everyone else’s. But when you invite others to sketch the idea with you, you use the same visual language — the basic circles, squares, and arrows that we can all draw in some form or another — to get on the same page. Literally. And it creates a partnership. Instead of talking to each other or, worse, talking at each other, you’re working together when you sketch together on the design of an idea. And no one likes to read a Word document with bullet points. But almost everyone likes to look at a sketch. Sure, you could probably justify using Balsamiq or SketchUp or Omingraffle, or any other wireframing app, to compensate for your perceived lack of ability to sketch. People who think they can’t draw but who need to present an idea visually will often resort to these, telling themselves that since they can’t draw, the app will do that hard work for them. But what usually happens instead is that they spend twice as much time moving pixels around, getting boxes and fonts to look right, as they would have spent just sketching the idea out on paper in a visually imperfect but time-saving matter. When you pick up a set of shiny hammers, nails, professional power tools, and high-end lumber, you feel — even if it’s only subconsciously — that the only valid end result is a very expensive, polished house. Anything else would just make you look (and feel) like a substandard builder. But when you sketch, you have only a pencil and paper. (Or better yet, you ditch the pencil in favor of a pen in order to avoid the temptation to self-edit your initial, raw ideas with the eraser.) There are no pixels and polish to iterate on — you can only iterate on your idea. And those iterations are meant to look raw, unpolished, imperfect. Sketching sets the perfect expectations for the early stages of design work — so well, in fact, that there’s a set of wireframing templates for Illustrator that make all of your vector work look like sketches instead of professional, high-quality wireframes. The reason? When presenting design work to clients, presenting something that looks like a sketch puts them in the appropriate frame of mind for evaluating early ideas that aren’t meant to be final or polished. Sketched ideas are raw ideas, and we’re more open to possibilities when viewing them than we are when looking at or working with ideas presented with higher fidelity. The more you sketch, the better you’ll get. But you won’t improve if you never pick up that pen or pencil. 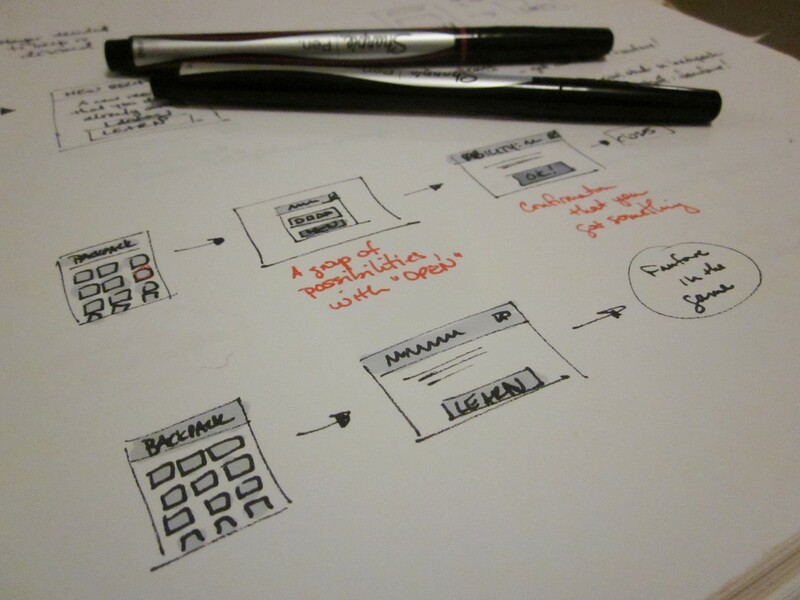 So ditch that false sense of security that fancy wireframing or sketching tools give you. Grab the nearest spare sheet of paper and whatever pen is closest to you, and sketch out those ideas. Paper and pen don’t bite, so don’t be afraid of them. Was in astrophysics, now a UX designer. Also a belly dancer, alpaca farmer, yarn spinner. See my work at http://www.carynvainio.com. Thoughts and inspiration about design.